When a powerhouse brand to small businesses deploys a massive ad campaign designed by huge advertising agencies, it will get noticed, but is it serving their customers well? That is the question small business owners need to ask themselves when they consider print vs digital marketing for their local business. 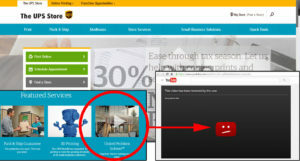 Recently the UPS Store launched an ad campaign targeting local small businesses. The campaign focuses on the UPS Store’s marketing expertise and how they help local businesses to design and deploy marketing and branding programs. The ad states “from printing to packing, shipping to marketing, there’s nothing we can’t solve.” Sounds pretty good, but are there some substantial red flags that every local business owner should know when comparing print vs digital? We think there most certainly are! Does a chain, franchised shipping and printing company know anything about marketing, messaging and budgeting for a small business today? Is their own marketing indicative of understanding digital marketing and print marketing well enough to profess their marketing prowess to local businesses? These are pretty bold questions, but questions that should be considered by small business before spending precious marketing dollars on print, or anything else for that matter. We wanted to investigate The UPS Store a bit more regarding these questions and found some things pretty alarming right away. After hearing about their new ad campaign via an AdAge article, we then went to their website to try to find some additional information. After scrolling down on their home page a little, we came across what appears to be their main video promoting this campaign, so we clicked on it. What happened next blew us away! The video linked from the bottom of their home page and opened in a new tab to a YouTube video that had been removed. That’s right. The brand professing to be able to help you with your marketing has removed the video promoting their program to help local business with their marketing, linking from their own home page to a YouTube video they removed. It get’s worse, The UPS store also claims to be able to help small business with their social media marketing. So we decided that we should probably click the link on their site and go check out their Twitter account. Now if a company is professing to be able to help you with your social media, shouldn’t theirs at least reflect a level of expertise that executes best practices and shows some level of competency? Unfortunately, that isn’t the case here either. The UPS Store’s Twitter account maybe posts an average of 3 times per day and mostly contains their own promotional pitches with very little value to their followers. We can’t stress enough this isn’t how Twitter is going to be effective, especially not for a local business. Should Small Business Be Investing In Print Over Digital Marketing? Certainly there are some benefits to using print for small business marketing. Handouts for a live event, business cards to give to prospective customers and in store signs for very specific niche reasons are a few of them. But should your local business invest in print INSTEAD of digital marketing? We would highly suggest the answer is no. There may be some benefits to print marketing, but they do not outweigh digital marketing for many reasons. Here are a few of the reasons we believe that small business should be investing in digital marketing at the highest budget levels they can afford, rather than throwing away their marketing dollars on print. 1- Longevity – When comparing print vs digital marketing, longevity needs to be a major factor to consider. Your small business digital marketing footprint is evergreen, where print is not. What do we mean by that? Digital marketing by nature lasts almost forever. Your small business website, blog, graphics and other digital content make up your local business footprint online and remain there where they can be discovered. With print marketing, the small business must continually invest in new one-time pieces that may or may not be viewed, but are certainly filed in the waste basket. 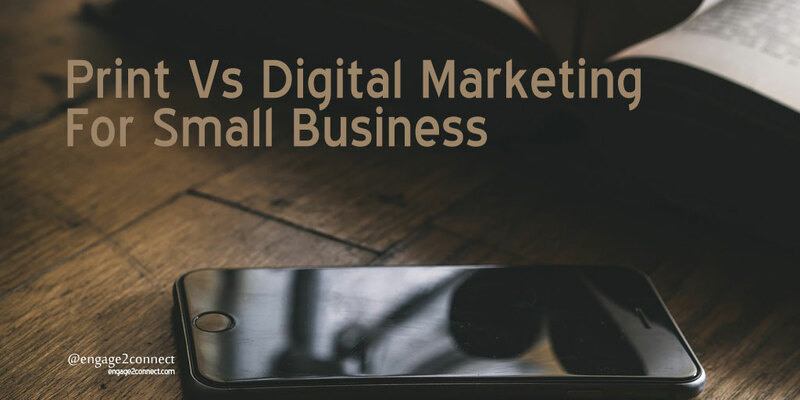 Digital marketing for small business delivers a long-term footprint online that can be consumed by your target customer when they are in need of what your local business does. 2- Cost – Print expenses are challenging for small businesses in that their cost per impression can be quite high and as we stated above, is calculated on a single use metric. One person receives one print piece and discards it. On the contrary, digital media has an ongoing cost per impression metric that enables the digital piece to be continually lowering its cost per impression by nature of its longevity. Small business marketing should take into account the overall, long-term costs for each of their marketing components, including print. Spending money on unproven print marketing tactics that do not take into account the current digital age can be very expensive beyond simple dollars. Lost opportunity costs resulting from not investing properly in your digital marketing efforts can make your overall marketing more expensive than it needs to be. Using print marketing for your local small business should be highly strategic and have well supported reasoning behind it for it to make any sense. 3- Reach & Connections – One of the huge benefits of digital marketing over print is the ability to reach and connect with your target customers better. Print or direct mail marketing is simply a numbers game that requires your local business to roll the dice and hope something sticks. Print marketing does not enable you to effectively or profitably expand your local marketing reach to make multiple connections with your prospects, as does digital marketing. 4- Just In Time – Lastly, digital marketing enables your small business to be at the right place at the right time, when your customers are actually looking for what you do. Proper utilization of an effective small business website, content marketing, social media, search engine and email marketing for your local business can ensure that your prospective customer finds you at the time they are looking. The benefits of just in time marketing for your small business cannot be understated here and should be part of your print vs digital marketing analysis. Marketing for any local business today has become quite complex and even expensive when calculating costs and net return. It is more important than ever that your small business is investing your marketing budget on things that will move the bar both short and long-term. Part of your decisions process should be to recognize flashing advertising by large brands, that attempt to get your marketing dollars invested in printing, doesn’t always equate to being effective. Be careful out there.